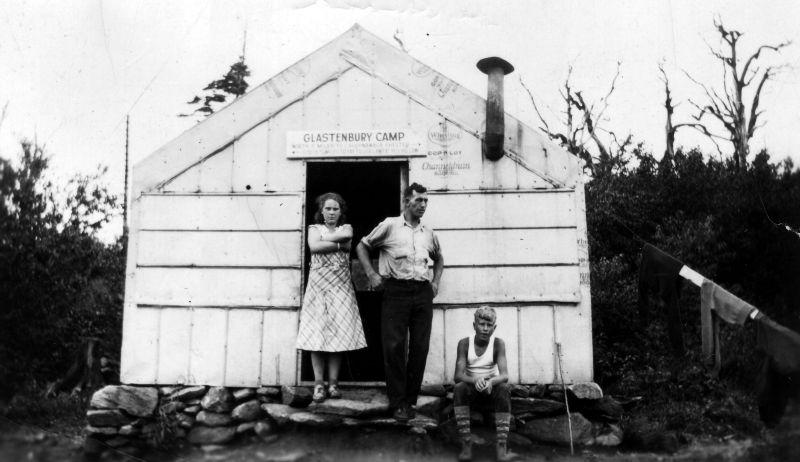 This historic photograph is of Glastenbury Camp in the summertime. There is a girl in a dress standing in the doorway with her arms crossed. To the right of her is a man and seated to the right of him is a young boy. The camp is covered in some type of metal siding and the roof has some kind of roofing insulation printed with the logo, "Wheeling / Cop-R-Lot / Channeldram roofing". There is a front door to the camp and the chimney extends out from the front of the roof. A sign above the door reads, "Glastenbury Camp, North 5 miles to Caughnawaga Shelter (arrow pointing right)", and below that, "(arrow left) South 5 miles to Fay Fuller Camp at [illegible word] Hollow". The foundation of the camp is made of small, semi-flat boulders and a clothesline hangs from the right side of the camp from which a few clothing items hang. A tree stump is visible just to the left of the camp and the area in the background is heavily wooded. John Adams writes on 2014-01-06: Glastonbury is an inincorporated town. It was a town back 100 years ago when the forests were being logged. US 7 which is a two lane expressway like MA Rte.2 West from Exit 19 where US 202 goes North towards Baldwinville and Winchendon in the town of Templeton to the town of Phillipston as it heads toward Athol known for Starret Tools. It goes to a two lane Hwy. west of this exit not unlike Rte 7 does north of Bennington. 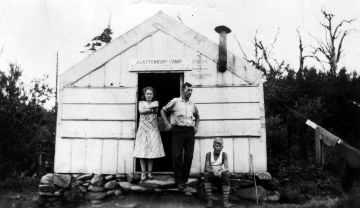 On back of photograph, "Glastenbury Camp, Summer"